The Magna Lock is a magnetic cupboard lock that features a concealed fixing. This incredible device installs to the inside of your cupboard or drawer without an external keyhole. Perfect for securing medicine cabinets or drawers from children, locking that knife drawer etc. Surprisingly inexpensive, these units can be easily installed for less than $10. 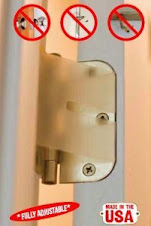 Thats total concealed security (no keyhole) for your cupboard or drawer for $10. Bilock is without doubt the simplest, easiest and most user friendly security product to evolve since the invention of the modern pin tumbler mechanism. The efficiency of the Bilock system is enhanced with the use of Promaster 5 master keying software. Bilock cylinders are tailored to suit almost all current hardware lines in the USA. The factory will even custom build on request. 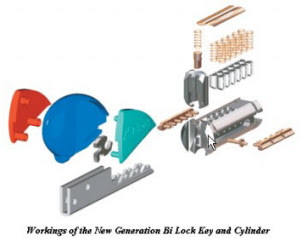 Master Key Systems America is currently designing a Bilock conversion for safety deposit boxes that will dramatically enhance the security, functionality and ease of use for banks, their customers and security departments. I use Bilock on my home because it is by far the most secure product and I can absolutely guarantee, no person can provide duplicate keys. I do not use Grade 1 products, but standard residential grade 2 and the Bilock product fits easily and beautifully maintaining the character of the premises while providing funtionality and security second to none. National Public Radio recently aired this report about a sting operation that nabbed "Bump Key Bandits" in Texas. This is further evidence of the vulnerabilities of almost all conventional lock and key systems currently used across America today. Click on the picture to listen to the radio report. Bilock, is the only pin tumbler product in America that is 100% fully guaranteed bump proof. 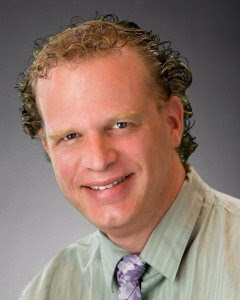 Locks210.com and our parent company, Master Key Systems America LLC offers Bilock as our signature product. When combined with the Bioaxxis BD1 fingerprint biometric deadbolt, you create the most formidable lock product available today. If lock bumping doesnt or hasnt concerned you in the recent past, perhaps it is time to re-examine your priorities? 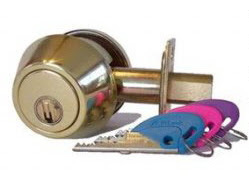 Many houses and residential condominium and apartment complexes use sophisticated master key systems to easily maintain smooth and efficient maintenance access to residential entries and public areas. 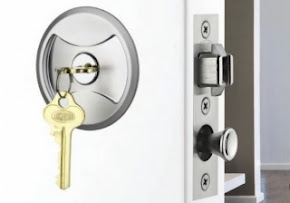 With all the recent publicity surrounding lock bumping and the quantity of news stories across America about this issue and the issues relating to Scam and Phony locksmith companies, consumers need to be more diligent and proactive than ever before. Can safes offer an imaginative, and subtle, way of hiding valuables. 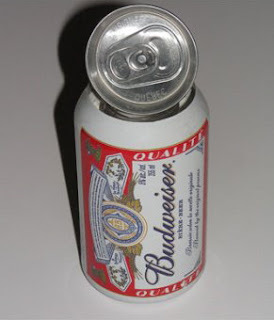 Keep your can safe in the kitchen or fridge and they will be indistinguishable from the real thing. Possibly the most useful home security launched for years! 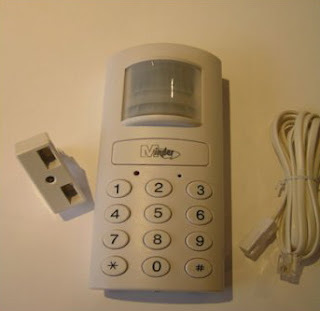 This is a passive infra-red alarm which will dial a pre-programmed telephone number as soon as an intruder enters the premises. It dials out automatically as soon as it detects movement within 6 metres. A 125 decibel alarm siren will sound 20 seconds after the first telephone number has been dialled. If you want to you can switch the siren off for silent telephone alert only. Up to 3 telephone numbers can be programmed to be dialled simultaneously. INFRA-RED BEAM DETECTS MOVEMENT UP TO 6 METRES AWAY. EASY TO PROGRAMME 4 DIGIT CODE. NO WIRING - EASY INSTALLATION. RECORD YOUR OWN 6 SECOND MESSAGE. We could learn a lot from crayons. 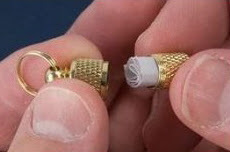 Originally designed to hold identification information for pets, these tiny cases (1" long by 1/4" to 3/8" dia.) are equally useful for attaching to backpacks, equipment bags, or anything that might get lost or left behind. Turned from solid brass, each has a plated steel split ring for attachment to a ring, buckle, cord, etc. They are attractive, durable and useful, whether for pets or people. Six of these little cases total less than 1 oz in weight. 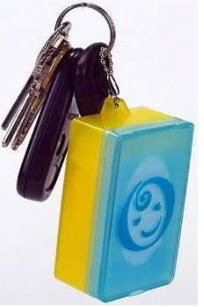 This novel key ring is actually a case for sanitary wipes, also know as Wet Ones (overseas). This great idea is perfect for mom or dad, when out with the kids and in desperate need to find something to clean up the kids hands or face. Of course there are many other uses for it too. It might be the perfect accessory for you or me to have that sanitary wipe handy when you least expect it. Known as Teeny Towels, they are commonly available from Target Stores for $9.99. There is also an insect repellent version for $11.99. Always looking for your car keys? 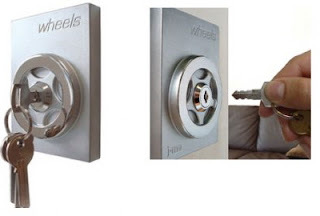 Look no more, this Wheels Key Holder will keep your car keys in place when you have it mounted to the wall. This holder comes with a dummy key that's used to attach to your car keys, and simply insert the dummy key into the holder and you're done! Never lose your keys again.